Cosmetic dentistry covers a multitude of procedures that improves the beauty and health of your smile. With today's cosmetic dentistry procedures, it has never been easier to attain a beautiful, healthy smile ... a smile that's dazzling, white, straight and even. Dr. David T. Dang is a LVI trained dentist who take into account your unique concerns, hope and dreams to create the perfect smile for you. With an enhanced smile, you may experience a sense of self-confidence and self-esteem as you never have before. That confidence may carry over and impact your personal and professional life as well. An enhanced smile will not only make you look good on the outside, but also feel good about yourself on the inside. Dr. David T. Dang can create an absolutely beautiful smile for nearly anyone in just a few office visits. The results look and feel completely natural and durable. New Brite-Line Smile is resistant to future staining from things like coffee, tea, wine and tobacco. A crown (often called a cap) is an artificial cover that restores a decayed or damaged tooth to its normal shape and size. It is useful for protecting the structure of a tooth that is cracked or broken. 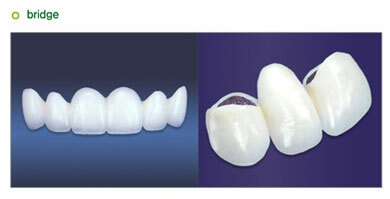 A crown can also be used to change the shape of tooth, to correct a bite or cosmetic problem, or to replace existing broken or poor - fitting crowns. A crown is made of gold, other metals, or porcelain. A fixed bridge can replace one or more missing teeth. It consists of one or more replacement teeth attached to crowns that are placed on two or more surrounding support teeth. Along with replacing teeth, the fixed bridge helps restore the normal function and proper position of your bite. A fixed bridge is made of various metals, porcelain, or a combination of the two. With good oral hygiene, your crown (bridge) will last longer. 1. Brush and floss around your crowned tooth (bridge) thoroughly to remove decay - causing germs. 2. See your dentist regularly to help prolong the life of your crown (bridge). 3. Ask your dentist about special aids. Veneer is a terrific cosmetic solution for permanently stained, chipped, discolored, misaligned teeth, or even to revitalize old crown and bridgework. Cerinate and Luminier is a porcelain veneer that can be made as thin as contact lens and it will take only two easy dental visits.